Description: Erect perennial herbs, from ovoid bulbs, stems slender, usually one per bulb, 2-6 dm tall, bearing a few long, narrow leaves and 1-3 flowers at the apex; flowers 3-merous, large, bell-shaped, erect; sepals lanceolate, 2-3 cm long; petals obovate, pale yellow, 3-4 cm long and 2-3 cm wide, each with an interior basal gland surrounded by golden hairs that branch at the tips; capsules linear-oblong, acute, 3-angled. Flowers late July and August. Similar Species: Calochortus gunnisonii is the only species of mariposa lily in the Sangre de Cristo Mountains. Variety gunnisonii also occurs in these mountains and is distinguished by its white, pale purple, or dark purple petals. Distribution: New Mexico, southwestern Mora, northwestern San Miguel, and southwestern Colfax counties; southeastern part of the Sangre de Cristo Mountains. Habitat: Meadows and aspen glades in upper montane coniferous forest; 2,900-3,400 m (9,500-11,200 ft). Remarks: This is hardly more than a color form of a variable species and needs further study. Yet it is difficult to find. Attempts to relocate the historical population on Hermit Peak have been unsuccessful. A new population (with photo documentation) was reported from southwestern Colfax County in 2006 by Bill Dobbs. Conservation Considerations: Presumably, variety perpulcher requires the same habitats as the common variety. Nothing is known of this species response to livestock grazing and forest fire. Gardening hobbyists will occasionally take mariposa lily bulbs from their native habitats for gardens, but these efforts nearly always go unrewarded and should not be attempted. *Cronquist, A., A.H. Holmgren, N.H. Holmgren, J.L. Reveal and P.K. Holmgren. 1977. Intermountain Flora, the Monocotyledons, vol. 6. Columbia University Press, New York. Ownbey, M. 1940. 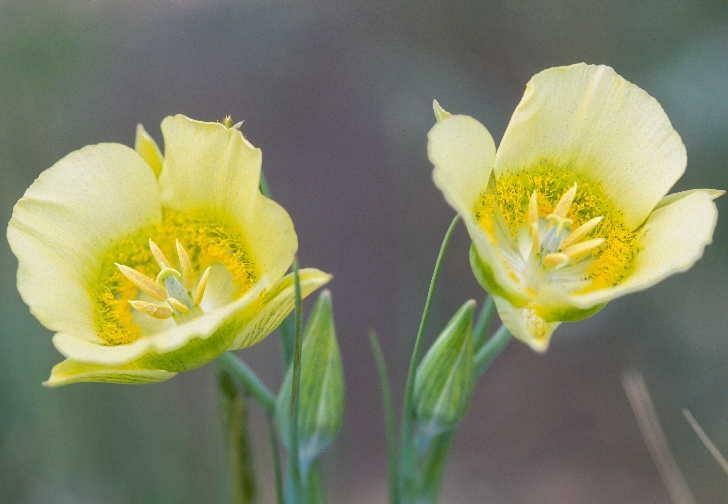 A monograph of the genus Calochortus. Annals of the Missouri Botanical Garden 27:371-553. Calochortus gunnisonii var. perpulcher SoC SS Sen . S4? G5T4?